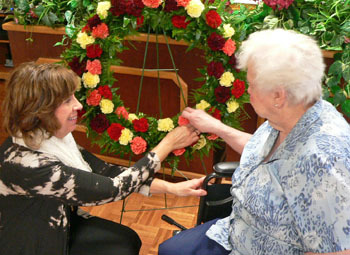 From left is St. Luke Pastoral Care Coordinator Debby Greutman with Anita Dennie as they place a flower on a memorial wreath as part of a Memorial Service held at St. Luke in honor of recently deceased residents. The service was attended by family, friends, residents and St. Luke staff. OSWEGO – Family and friends gathered at St. Luke Health Services for a Memorial Service held in honor of residents who had passed away over the past few months. St. Luke Pastoral Care Coordinator Debby Greutman led the ceremony with Jenn Greutman as the featured soloist and song leader. While the name of each deceased resident was announced, a flower in his or her honor was added to a Memorial Wreath. The ceremony was a meaningful experience for those gathered as words of remembrance from family, hymns, prayers and even some laughter could be heard when joyful memories were shared. “Families put their trust in St. Luke and we are honored to be able to bring everyone together to remember and to celebrate the lives of those who have gone before us, and also to share in the feelings of loss families may be experiencing,” said Debby Greutman, who organized the memorial service.